During Kindness Challenge Week at BCS, Mrs. Crawford’s second grade class heard the story Lily and the Paper Man. Her students instantly recognized kindness and compassion in the main character, Lily. Heartfelt comments and suggestions were offered by too many children to ignore! The children felt compelled to do something to help, here, close to home. 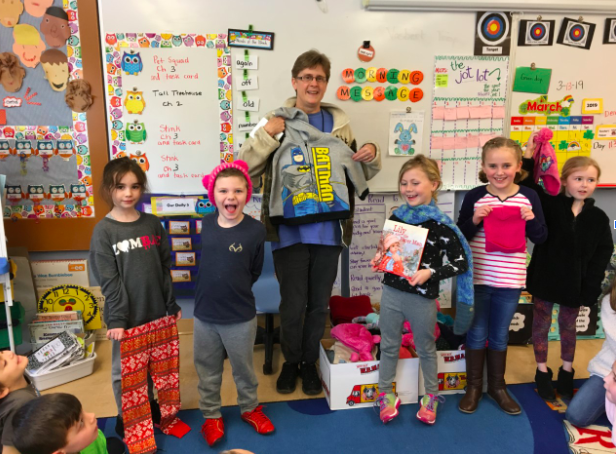 And so, for that reason, the class (along with Mrs. Hall’s class) accepted donations of hats, scarves, mittens, and clean, gently worn clothing for children. These donations were given to friend, Selina Lufkin, who operates the Shoestring Thrift Shop here in Brewer, helping those in true need. What a lovely way to put kindness into action, while recognizing the intuitive nature of children to help.